Societi Bistro is unashamedly one of my most beloved restaurants, and not just because there is a dish on the current winter menu named after me. Of course, that is the highest of flattery, but even if there wasn’t – and soon won’t be – I keep going back because it’s warm and comfortable, the service is great, the food is amazing, and there is a wonderful wine list with everything available by the glass. Add onto that, decent Wi-Fi and conveniently close to where I live, and Societi is an easy go-to to do some work on my laptop or have meetings. For many years, Societi Bistro has acknowledged its friends and supporters – in the media and elsewhere – by naming dishes after them on the seasonal menus. I’ve been lucky enough to be on the winter menu for four years in a row – three with the same dish, and this year with a new one as my swan song. The reason the name dishes will be phased out by early next year is part of an evolution which has already begun; the winter menu itself is drastically pared down and sees a return to the format of a small selection of signature dishes complemented by daily blackboard specials in the true bistro spirit. By its simplest definition, a bistro is a small restaurant serving inexpensive meals. Expanding on this, is that those meals are home-styled and comforting, something which Societi delivers every day. On top of all this, since March it has been running something called Bistros Go Global, which has focused on a multitude of countries and regions with weekly three-course menus paired with South Africa wines. So far, the culinary journey has taken diners on an exploration of flavours from North Africa, Spain, Portugal, and Japan, as well as regions in France and Italy, among others. Bistros Go Global concludes this weekend with Louisiana in the USA, and the whole team can take a well-deserved bow. The three courses can be ordered together or individually, and mixed and matched with the regular menu and/or blackboard specials. It does make deciding what to eat a bit difficult, but I’m here to help. Head chef Robert Giljam came up with “my” delicious winter dish – which, even better, comes in at just R98. Giljam is strongly influenced by Asian flavours so he slow cooks some pork neck and pulls it, then tosses it in a pan with an orange and teriyaki glaze. It’s served with a fresh slaw of carrots and crunchy bok choy and a salsa packing a hint of chilli heat. Pile all that into a pancake, drizzle with the juice of fresh orange segments, and eat. It’s a bit messy if you do it with your hands but that’s part of its charm. 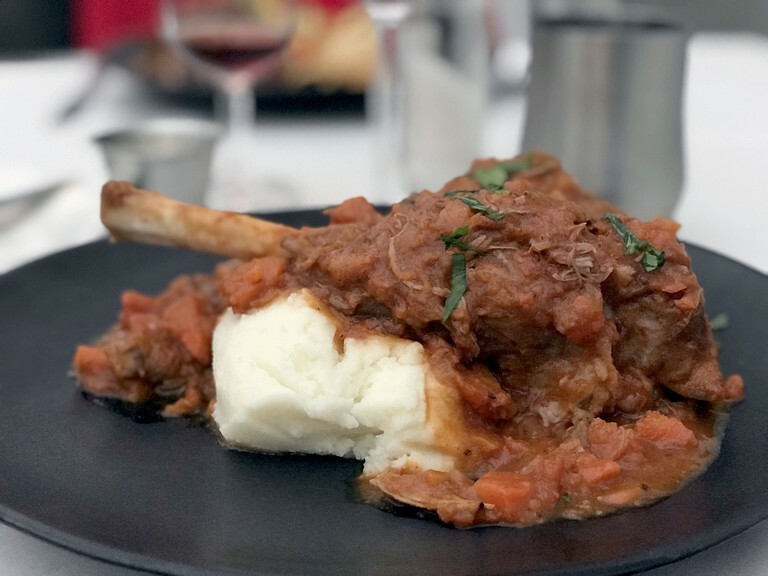 As much as I love this dish, there’s another one that you simply must have before winter turns into spring: the lamb shank, named for author, playwright and journalist, Tony Jackman. I had this last week and it’s, not to understate it, jolly marvellous. The plate arrives with a pile of steaming, rich tomatoey sauce with a bone sticking out of it. I took my fork and poked gently to find out what was going on under there, and half the meat fell off the bone. Literally! The steak knife which has been supplied wasn’t at all necessary. Wine pairing recommendations will most likely be made by your server, but I was already on the Springfield Work Of Time, which is a firm favourite of mine, and we all got on very well. * Societi Bistro is at 50 Orange Street, Gardens. Opening hours: lunch and dinner, Mondays to Saturdays 12pm till 9.30pm; The Snug Mondays to Saturdays, 12pm till 10pm. For more information; call 021 424 2100, send an to email info@societi.co.za .